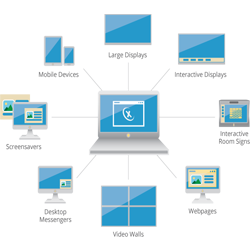 Visix provides unified, enterprise-level digital signage. Our software publishes to displays, desktops, webpages, smartphones and room signs – all from a single interface. Communicate from anywhere, to anywhere. Why struggle with modifying retail applications to fit your needs? We concentrate on organizational communications, and our products and people are focused on making our products work in YOUR environment.